Should You Take a Deduction for the Business Use of Your Home? Home » Taxes » Should You Take a Deduction for the Business Use of Your Home? When you run a home business, there are a number of expenses that you take on yourself. Owning a business means that you take on some expenses, such as paying for your health insurance without help from an employer, and that you pay for the facilities you use. Luckily, a number of the expenses you incur when you run your own business are tax deductible. You have the option to deduct travel and entertainment expenses related to your business, as well as deduct some of the costs of your health insurance. You also have the option to deduct the portion of your home used for your business. 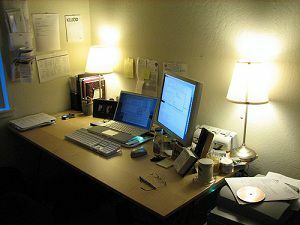 What is a Home Office? Before you take a tax deduction for the business use of your home, it’s a good idea to understand what the IRS considered “business use.” While the IRS isn’t as likely to flag your tax return for a an audit due to home office deductions as in the past, it’s still a good idea to make sure that you are doing everything by the book. Your home office should be a space dedicated exclusively to business operations. You don’t actually have to devote an entire room to your home office; in fact, my home office space is actually the area that comprises my desk, printer stand, and business filing cabinet. It’s located in a room that, for lack of a better word, we call my office, but I don’t count the entire space as my business space because a large portion of it is used for storage. That’s an important distinction. If you use the space for other activities that aren’t business-related, you can’t deduct the related expenses on your tax return. So, even though I spend some of my time doing work on my couch, I can’t deduct that space because it is often used for something other than my business functions. And, of course, the storage room that houses my office can’t all be deducted. However, the portion of the room devoted entirely to my home business is tax deductible. And that’s the part that I deduct for tax purposes. When you decide you want the deduction for the business use of your home, you need to determine how much you can deduct. In most cases, you can deduct a portion of what you pay in mortgage/rent costs, insurance costs, utilities and HOA fees. First, determine the square footage of your home. This is information you should have in your homeowners insurance papers, or information that your landlord can provide you. Next, determine how much of your home is being used exclusively for business purposes. Perhaps you have designated a 6 x 8 foot portion of your family room, comprising your desk, and a few other accouterments, for your business area. The square footage of such an area is 48 feet. If your home’s total square footage is 1,800, you divide that 48 by 1,800 and end up with 0.0267 (or 2.67% of the home). Now, you multiply all of your eligible expenses by 0.0267 to get the dollar amounts involved. If your mortgage payment is $1,000 a month, you can deduct $26.70 a month, or $320.40 for the year. Follow the same formula when determining how much you can deduct for utilities like heat and electricity, and for your homeowners/renters insurance premiums, and for other fees like HOA fees. Add it all up, and you will know how much you can deduct for using a portion of your home for your business. But Should You Take the Deduction? There are some things to keep in mind, though. In some cases, when you deduct a portion of the depreciation of your home on your taxes, you might end up owing taxes later. You will have to add up the depreciation deductions you have taken over the years, and when you sell your home, you may owe capital gains taxes on the total amount — this only applies if you profit from the sale of your home (if you there is a loss on the sale, you don’t have to worry about it). Also, consult with a knowledgeable tax professional about the possibility of triggering the Alternative Minimum Tax (AMT) in combination with your itemization. You don’t want to trigger the AMT, so make sure to consider this. It might be worth it to forgo the deduction if it will cost you more in the long run. Finally, understand that your home office deduction is capped. You can’t deduct more in a year than your home business makes that year. Some people think that they can deduct big time losses, and shelter some of their other income. That’s not how it works. You can’t use business tax deductions as losses that amount to a tax shelter. Standard vs Itemized Tax Deductions, Which is Better? What if I were to purchase a home for combination use by employees? They would work out of and live in the house. I’m a renter, so the home office deduction never means more taxes later, e.g. no depreciation to recapture. The risk involve is not worth it for small amount of money. If a bigger amount I would of take the deduction. My accountant likewise advised me not to take the home office deduction. When I asked my CPAs, they both advised the same thing — don’t do it, too little reward for too much trouble. I never took the deduction because it was not worth the risk for the few dollars.